Want to get fitter? Lose some weight? Most people know the basics: do some exercise and be more careful with the foods you eat. Those are the two most common starting points. 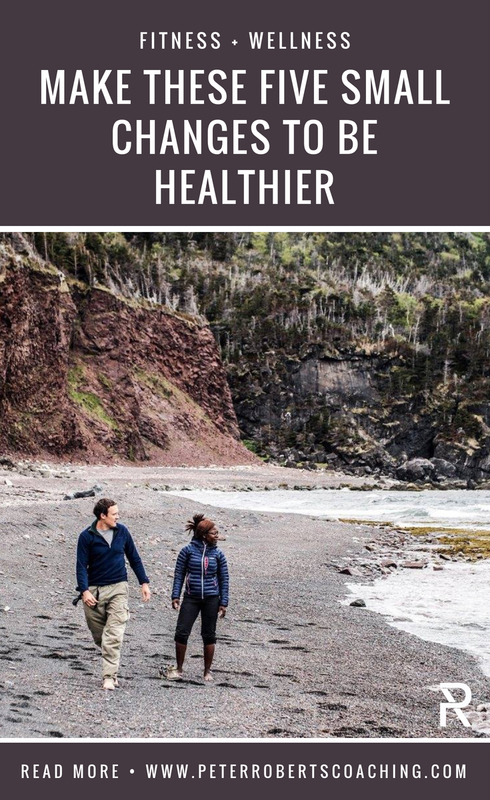 But you can make a few other changes to be healthier almost instantly, and in this post, I'm going to explain 5 of them. If you want to perform at your best or just stay fit with longevity, you should go beyond that. These simple yet significant basic lifestyle changes can have a huge impact on how you feel and perform. Our bodies thrive on routine, especially when it comes to sleep and wake times. Having a predictable routine is critical to optimizing your body's natural rhythm (called "Circadian Rhythm"), which impacts your appetite, energy levels, and several aspects of hormonal balance. In fact, I worked with one client recently who had suddenly gained more than 20lbs over 6-months, yet prior to that she'd maintained a steady weight for years. When I asked what had changed over the 6-month period, the only change was that she had started working nights. The disruption of her day and night cycle not only made her feel more tired, but it caused her to gain fat. This is something I see frequently, and the research shows the same trend. Here's what you need to know. Consistency in bed time and awake time is a crucial small change you can make to be healthier. Even if you work late, try to get to bed and wake up at the same time daily, even on weekends. The second key is knowing the importance of light. Light is the #1 signal to our body that it's time to be awake and alert, just as darkness signals that we should start winding down for the day and ready for bed. One of the downsides of electric light and the incredible array of possibilities technology has provided is that it's pushed our bedtimes back further and further. For more information on sleep, have a look at this article. You only get the benefits from the food that your body breaks down and absorbs. That process starts in the mouth. slow yourself down, thereby giving yourself the opportunity to listen to the signals your body sends when you're getting full. If you eat too fast, you'll miss those signals, and only realize how full you are after you've finished eating. Digestion is a 36+hr investment and it starts in your mouth. Don't short change yourself. Research shows that operating in a state of even mild dehydration leads to measurable performance losses in strength and endurance tests. It also makes you stiffer and less mobile. We also know that our body often confuses the feeling of being thirsty with that of being hungry. In other words, you may crave something to eat even though you're not truly hungry. All you need is some water. Here's a handy baseline for water intake. Find your bodyweight in pounds. Drink half of that number in fluid ounces daily. For example, if you weight 200lbs, you want to drink 100oz per day as a starting point, and then adjust based on activity level. If you produce more sweat than the average person (you know who you are!) you'll likely want to increase your intake. For the majority of us who work sedentary jobs, daily movement needs to be a huge priority. It helps keep our tissues mobile and not stiff [for more on this, check out one of my favourite short videos on YouTube. I consider this essential viewing!]. It stimulates blood flow to bring nutrients to our tissues and remove waste products. It makes us feel more energetic, especially if we can do it outside in the sun (see point #2). And, it stimulates our digestive and lymphatic system which require movement to operate effectively. You can do this in a variety of ways, from adding some 15-minute walks into your day, cycling to work, doing a fitness routine, or just taking 5-minute movement breaks throughout the day to do some body-weight squats, push-ups, a few stretches, etc. Anything to move through a full range of motion and move blood. Diet plans can quickly get over complicated, but there's one thing that pretty much all experts agree. Eat plenty of colourful vegetables. They're full of vitamins and minerals, and have lots of fiber and bulk to make you feel full and keep your digestive track moving. See if you can eat at least two fist-sized portions of vegetables daily. If you want to take it up a notch, add some vegetables into each and every meal. Start doing this and you'll feel better.